1 of 4 Heat oven to 375 degrees . Arrange a rack in top third of oven. 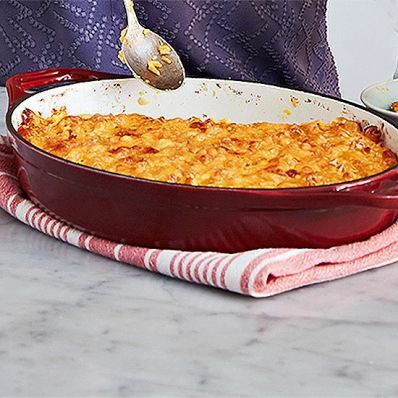 Grease an 8-inch-square or 2-quart oval baking pan. 2 of 4 Cook macaroni as per package directions (about 7 minutes) in a large pot of salted boiling water. Add carrots 1 minute before pasta is finished cooking; drain well in a fine-mesh strainer. 3 of 4 While pasta is hot, stir in all but 1/2 cup of the cheddar and the butter. In a bowl, whisk sour cream, milk, eggs, salt, mustard powder and pepper. Fold mixture into pasta. 4 of 4 Scrape mixture into prepared pan. Sprinkle remaining 1/2 cup cheddar and the Parmesan over the top. Bake at 375 degrees until firm to touch and golden-brown, 30 to 40 minutes. Per Serving: 23 g pro., 810 mg sodium, 21 g Fat, total, 155 mg chol., 410 kcal cal., 4 g fiber, 12 g sat. fat, 34 g carb.